(CBS News) Lucky the kitten is certainly one lucky kitty. 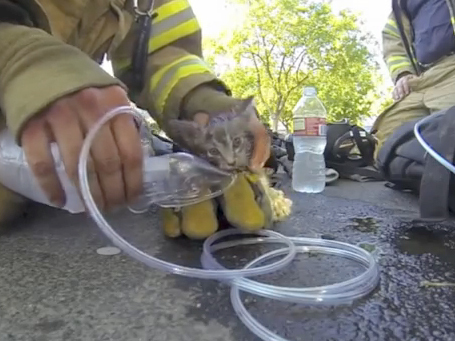 Not only did the appropriately-named cat make headlines when he was rescued by a Fresno, Calif., firefighter earlier this month, but now he is starring in his own movie of sorts. Firefighter Cory Kalanick, who originally saved the little guy and captured his heroic acts on his helmet camera, has turned the footage into an indie movie-style preview fit for Cannes. Check out the clip to see just what Kalanick did in the reworked rescue footage posted by YouTube user kalanick1111 (presumably Kalanick himself). "The Rescue: A True Story" shows Kalanick picking up the passed out little ball of grey fuzz from a smoke-filled house, and bringing him to a firetruck where he revives him with a tank of oxygen, a bottle of water and a little TLC. And if you think that actual act of saving Lucky is dramatic on its own, the addition of the melancholy-turned-hopeful music, combined with made-up Sundance-type awards and faux reviews, such as "A triumph of the human spirit," make this one real-life film I'd certainly go see (or at least I'd watch the preview a few more times).